Boston Harbor Islands National Recreation Area [TI265] - $9.95 : Trail Explorers Outpost, Keeping the Adventure Alive! Our new detailed recreation map for the Boston Harbor Islands National Recreation Area is a two-sided, waterproof map which covers all 34 of the harbor islands plus shoreline parks, downtown Boston, access and ferry interpretive information and neighboring communities. The front side contains both bathymetry and topography - making it the perfect multi-functional map for kayaking, hiking, fishing, wildlife viewing and more. This beautiful map is a perfect souvenir to remember your trip to the park as well as a highly functional tool for those that recreate here frequently. Users will find clearly marked ferry terminals and routes, water taxi stops, boat ramps, moorings, beaches, historic sites, campgrounds, trails, forts, and hundreds of place names. A UTM and Latitude/Longitude grid, as well as compass rose, scale bar, and marine navigation markers (buoys, lights, and soundings) will keep you pointed in the right direction. The reverse provides even more detail, using high-resolution satellite imagery, revealing the historic structures, facilities, and terrain. Valuable park information, including recommended places to visit, history, regulations, and safety information will aid all travelers in making their island adventure safe and fun. 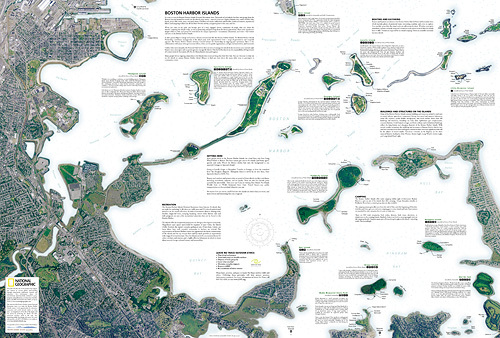 Our Boston Harbor Islands map was developed in close collaboration with the Boston Harbor Islands Alliance, the non-profit interpretive agency that supports and promotes this unique park, and the members of the Boston Harbor Islands Partnership including: The National Park Service, The DCR (Department of Conservation and Recreation), U.S. Coast Guard, Mass Port Authority, Massachusetts Water Resource Authority, City of Boston, Boston Redevelopment Agency, Trustees for Reservations, and Thompson Island Outward Bound. 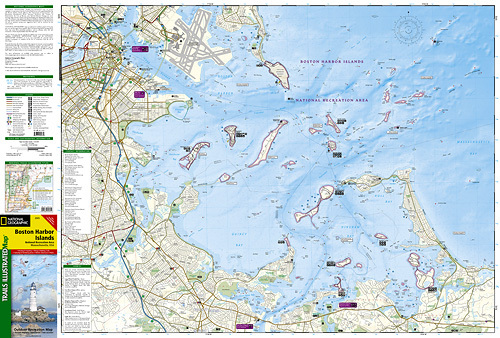 Our Boston Harbor Islands map is printed in the U.S.A. on a durable synthetic paper, making it waterproof, tear-resistant, and trail tough - capable of going anywhere you do. The map is two-sided, and can be folded to a packable size of (4.25" x 9.25"), unfolded size is (26" x 38"). Georges Island, Spectacle Island, Peddocks Island, Lovells Island, Bumpkin Island, Grape Island, Thompson Island, Little Brewster Island, Deer Island, World's End, Webb Memorial State Park, Nut Island, Boston Light, Graves Light, Boston Inner Harbor, Hingham Bay, Quincy Bay, Hull, Dorchester Bay, Marina Bay, Boston, Charlestown, Fort Warren, and Fort Independence. A place where you can walk a Civil War-era fort, visit historic lighthouses, explore tide pools, hike lush trails, camp under the stars, or relax while fishing, picnicking or swimming-all within reach of downtown Boston. Youth programs, visitor services, research, wildlife management, and more are coordinated on the park's 34 islands and peninsulas by the Boston Harbor Islands Partnership. Boston Harbor Islands National Park contains 12 diverse islands ready for exploring and 22 more that form an island wilderness. In all, there are 1,600 acres and 35 miles of undeveloped ocean shoreline on the islands. Unfolded size: 26" x 38"